Country Bear Jamboree, one of the opening day attractions at Walt Disney World will be going down for refurbishment from late August to mid October. Is it just a maintenance refurb or will the show be changed? 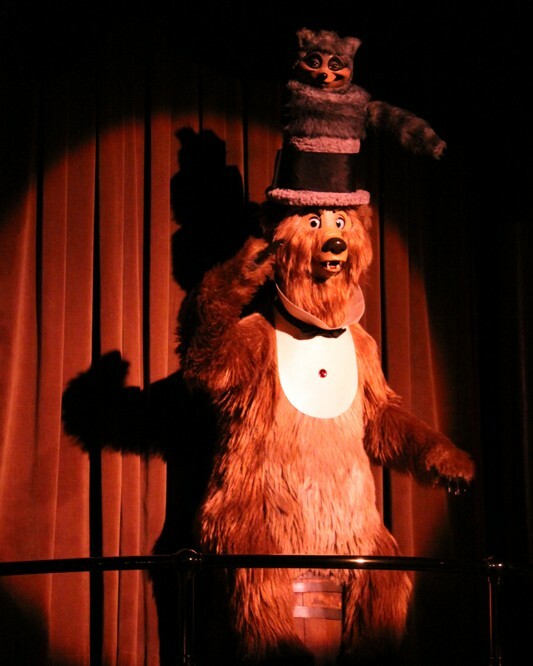 If the show is changed it would not be the first time as the show has been changed in the past to become the Country Bear Vacation Hoedown in February 1986 and a special Christmas show during the holiday from 1984 to 2006. The show, originally conceived to be an attraction for the Mineral King Ski Lodge in California became affectionately known as “Walt’s last laugh” because of the nice chuckle Walt got after seeing some drawings Marc Davis had been working on for the project. Legend has it that after this visit with Marc Davis, Walt said good-bye to Davis on his way out of his office, which was rare for Walt. A few days later Walt passed away from cancer. I believe the show and especially the characters are entertaining enough to remain in WDW indefinitely and I don’t ever see the bears getting evicted because of the connection that Walt had to them. However, Walt did not ever see the actual production so I I wouldn’t be surprised to see it change despite the opinions of so many die-hard WDW fans. It appears the bears will be on vacation the same time I will be so I will miss them in October but I will report on any changes after my trip in November! This entry was posted in Magic Kingdom, Refurbs, shows, WDW History and tagged christmas show, Country Bear Jamboree, Magic Kingdom, Marc Davis, Mineral King, music, shows, theme park, travel, vacation, Walt Disney, Walt Disney World. Bookmark the permalink. This is one of those attractions that really “takes me back.” It’s a classic and it bothers me to think about it being changed. That being said, sometimes “nostalgia” and “classic” to us die-hard fans, comes across as “old” or “dated” to first-time visitors. This is one of the attractions that I often wonder how first-time visitors perceive it. When we visited Disney in 2011, the small theater wasn’t even full. I also couldn’t help but notice the “primitive” audio animatronics. After seeing some of the newer animatronics in the parks, the bears’ movements don’t seem as lifelike as I know they could. The characters look great, but I do feel like the show would be improved if the characters could make larger, more fluid movements. While I love the show as it is, it might be time for an update to keep it fresh and alive. 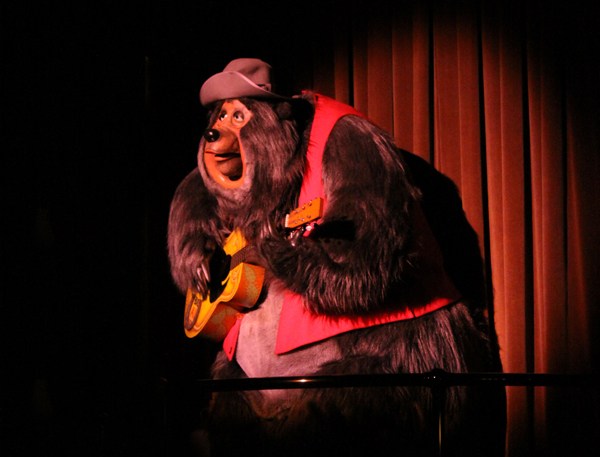 I’d rather see an updated version of the Country Bears than to have to “bear to say goodbye.” I wonder if there are updates if they will try to tie the attraction more to the less-than-wildly-popular Country Bears movie. I would guess that with such a short shut down, there won’t be much more than maintenance. Either way, I’m very happy the Country Bear Jamboree is sticking around. I agree that they shouldn’t tie it to the movie. Like you said, it worked for Pirates, but those movies were VERY popular. I would understand though if they did do a little rewriting. The show is cute and fun, but I think if they could add a few more “laughs” it would help. Also, if crowds remain low, maybe they could lift the stroller ban on this theater and allow sleeping stroller kids in. There is precious little to do at the Magic Kingdom when your kids are napping in their strollers. I would especially like them to consider this for the Hall of Presidents, assuming the theater isn’t full. That theater is huge. When we went there were like 12 wheelchair spaces in the back not being used. Plenty of room for a sleeping baby in a stroller. Plus, let’s face it, the hall of Presidents isn’t one the kids will be too bummed about missing. They could wait until everyone has come into the theater then decide if it’s safe to allow a stroller or two in…as long as it’s not a fire code ban.